Paris Jackson’s romance with bandmate Gabriel Glenn is heating up! See the PDA here, which is also Paris’ first photo in public since she slammed reports that claimed she checked into a treatment center. Paris Jackson , 20, was the image of health as she strolled down West Hollywood’s Melrose Avenue hand-in-hand with boyfriend Gabriel Glenn on Jan. 29! Both lovers were smiling wide and even synchronized with their alternative outfits, as Paris wore a bohemian fringe vest, elephant crop top and beaded jewelry. Her beau matched the casual vibe with a grungy Nirvana shirt. They’re not just SO’s but also bandmates for The Soundflowers, so it makes sense that they’d naturally sync. See their sweet PDA below! Within a day the news got back to Paris, who it turned out had just unplugged from her phone and social media. She posted a message to Instagram that read: “The media is exaggerating per usual. Yes i’ve taken a break from work and social media and my phone because it can be too much sometimes, and everyone deserves a break, but i am happy and healthy and feeling better than ever!” Paris even teased “new music” from her and Gabriel that’ll arrive soon — it looks like the lovers took a break from band rehearsals to go on the shopping date pictured below! 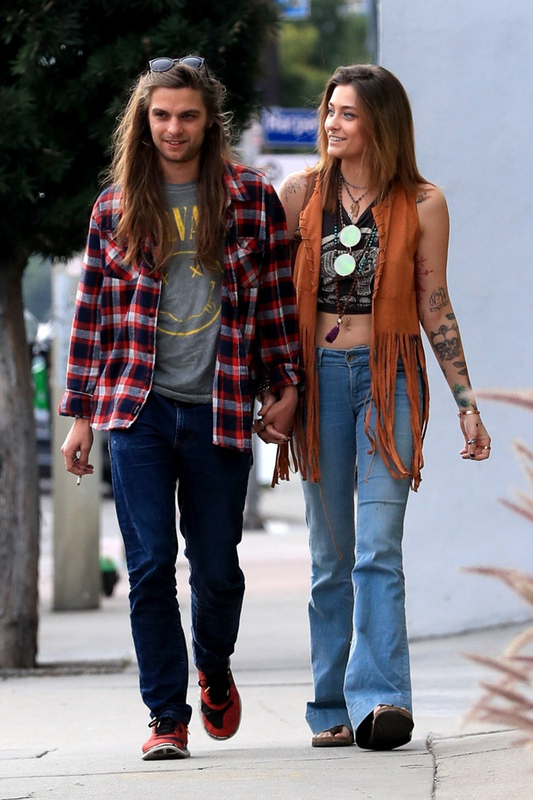 Paris Jackson enjoyed a date with boyfriend and bandmate Gabriel Glenn on Jan. 29, as the two strolled down Melrose Avenue in West Hollywood, Calif.
Paris has been rumored to be dating her bandmate since Aug. 2018, when they were photographed kissing and cuddling at The Soundflower’s second live show ever! Yup, we ship these two.